Home » Ancient » Karnac, Thebes. 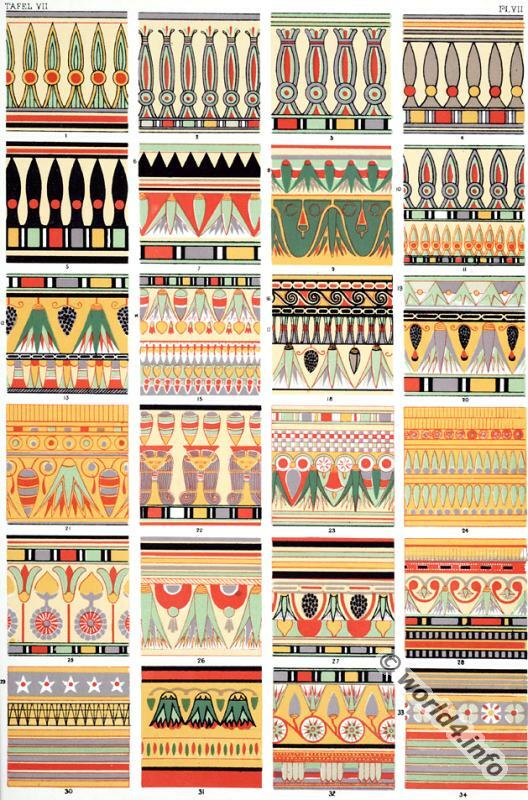 Egyptian Ornaments and Decorations. Karnac, Thebes. 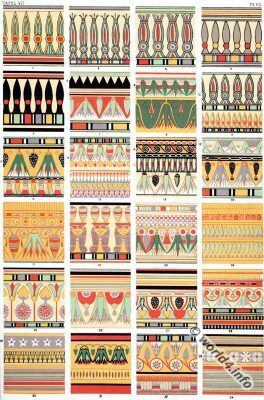 Ancient Egyptian Ornaments and Decorations. 1. Ornament on the top of the Walls of a Tomb at Benihassan. 3. Ditto, from Karnac, Thebes. 4. Ditto, from Gourna, Thebes. 6. Decoration of the Torus moulding of some of the early Tombs in the neighbourhood of the Pyramids of Giza. 7. 8, 9. From a wooden Sarcophagus. 10. From the Tombs, El Kab. 11. From the Tombs, Benihassan. 12. From the Tombs, Gourna. 16. From the Wall of a Tomb, Gourna, immediately under the Ceiling. 17. 18, 19. Portions of a Necklace. 20. From the Wall of a Tomb. 22. From the upper part of the Wall of a Tomb, Sakhara. 25. From the Wall of a Tomb, Gourna. 27. From the Wall of a Tomb. 29. From the upper part of a Picture. 30. Arrangement of Lines from dados. 31. From a Sarcophagus in the Louvre. 32. From the Wall of a Tomb, Gourna, representing the Lotus, in plan as well as in elevation. 33. From a Ceiling at Medinet Haboo. 34. Arrangement of Lines from dados, in Tombs. Nos. 1-5, 10, 11, always occur on vertical surfaces, and on the upper part of the walls of tombs and temples Nos. 7-9, 12, 14, 18, 20, are all derived from the same elements, viz. the lotus in a pendent position, with a bunch of grapes intervening. Tins very constant Egyptian ornament in some of its forms so much resembles the Greek moulding, usually termed the egg-and-tongue, or egg-and-dart moulding, that we can hardly doubt that the Greek moulding was derived from this source. Nos. 1 3, 15, 24, 32, exhibit another element of Egyptian ornamentation derived from the separated leaves of the Lotus. Associated to Ancient Egyptian Ornaments and Decorations. Previous PostColumns of the Temple of Luxor decorations. Next PostEgyptian Mummy cases. Ornaments and decoration.